The perspective from which a story is told is called its point of view. 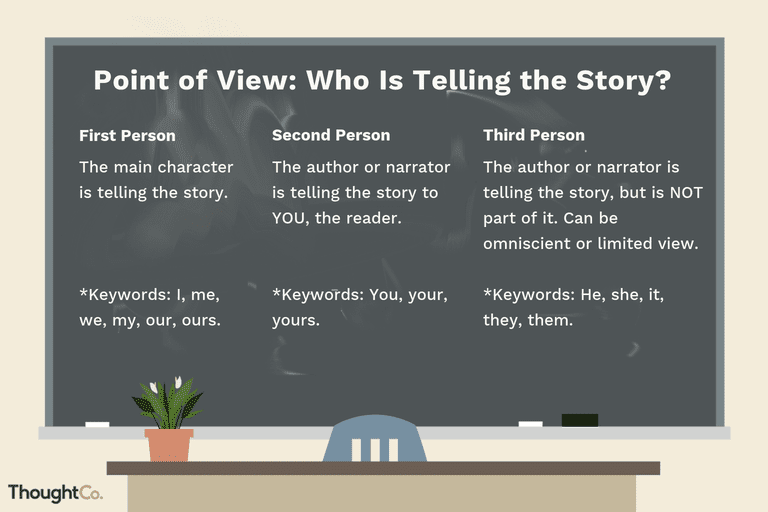 Understanding point of view helps students effectively analyze literature, improves their critical thinking skills, helps them understand the author’s purpose, and increases their ability to recognize potential bias. First person: The main character is telling the story. Uses words such as I, we, and me. Second person: The author is telling the story directly to the reader. Uses words such as you and your. Third person: The author is telling the story, but is not part of it. Uses words such as he, she, and they. Some third-persons narrators are all-knowing, but others have limited knowledge. First person. A first person point of view story is written as if it is being told by the main character and uses words such as I, we, and me. Two examples are "Green Eggs and Ham" by Dr. Seuss, or "I Love You, Stinky Face" by Lisa McCourt. Second person. A story told from the second person point of view puts the reader in the action by using words such as you and your. It can be found in titles such as "The Monster at the End of This Book" by Jon Stone or "If You Give a Mouse a Cookie" by Laura Numeroff. Third person. Stories written in third person show an outsider’s point of view using words such as he, she, and they. Books written in third person include "Stephanie’s Ponytail" by Robert Munsch or "Officer Buckle and Gloria" by Peggy Rathman. There are two different ways third person books may be written: omniscient and limited. Sometimes, third person point of view is broken down further to objective point of view in which the author acts only as a narrator. This style is prevalent in many fairy tales. In a book using omniscient point of view, the author writes from an outsider’s point of view but offers the perspective of multiple characters. "Blueberries for Sal" by Robert McCloskey is one example. A third person limited point of view tale is written from an outsider’s perspective, but the reader only follows the story based on what the main character knows. "Harold and the Purple Crayon" by Crockett Johnson or "Bread and Jam for Frances" by Russell Hoban are two examples. Anchor charts are visual aids to helps students work more independently. As an instructor teaches a lesson, the core concepts and relevant facts are added to the chart. The completed anchor chart provides students with a resource to which they can refer if they have difficulty remembering the steps or concepts of a lesson. A point of view anchor chart reminds students of the different point of view types with keywords and phrases and examples of the pronouns used to indicate each type. He sees the keyword “you” that indicates that the author is addressing the reader. Based on the anchor chart keywords, the student identifies the book’s point of view as second person. Help students become adept at correctly identifying point of view with a scavenger hunt. Visit the library or bookstore or provide a wide assortment of children’s books in the classroom. Give students a sheet of paper and a pencil. 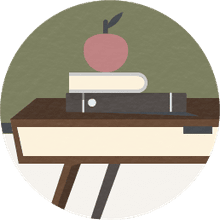 Instruct them to work on their own or in small groups, searching for at least one example (and listing its title and author) of a book for each point of view type. This hands-on activity will help students gain a more concrete understanding of the three main points of view. First, divide a whiteboard into three sections: 1st person, 2nd person, and 3rd person. Write the student’s sentence in the 1st person column. Then, choose other students to restate the same sentence in 2nd and 3rd person, writing their sentences in the appropriate column. Repeat the process for all steps of making a sandwich. Help students understand how point of view changes a story. First, read or tell the traditional story of The Three Little Pigs. Discuss with students how the story would change if it were being told in first person by one of the pigs or the wolf, rather than being told in third person. The third pig wouldn’t know anything that happened before his brothers arrived, breathless, at his door. Is he relieved that he can help his brothers? Angry that they led the wolf to his house? Proud that his home is the strongest? After your discussion, read "The True Story of the Three Little Pigs" by Jon Scieszka, which relates the tale from the wolf’s point of view. Read the book. Then, use a Venn diagram to compare the differences and similarities of the events based on two or more characters’ points of view.